With this guide to wall decor with paint, I hope to show how you can achieve a contemporary interior by painting your wall to go with your home interior. You’ll also find ideas to add unique touches to your wall and home decor. Before painting, I'd recommend you spend some money on a primer. This is where the stage is set for a great application of paint. This is particularly true if the walls have imperfections so the better the primer, the less the paint is absorbed into the wall. Ultimately, you're going to spend less money on the paint itself. If however, the imperfections remain despite the prep work, don't lose sleep over it. Paint it over with the best paint your budget allows and use strategically placed furniture and paintings to disguise these flaws. The goal of painting is to move your decoration forward, not slow it down. 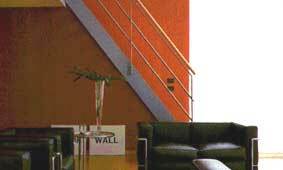 The palette for contemporary decorating using strong, bright and bold color is an evolving trend. Other than primary colors, consider searing secondaries such as orange, violet, lime and fuchsia since they add vibrancy to the interior. 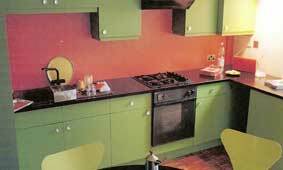 The sharp orange splashback contrasts well with the green kitchen furnishing shown below. As a general guide, strong color needs a strong hand. Rather than paint all four walls the same shade, it can be more effective, and less tiring to live with, to treat walls as separate planes and pick out one in a bright color while leaving the rest in black or white. 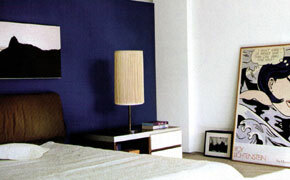 The picture below shows how a sapphire blue wall contrast with the white ones. The owner even selected a dramatic black and white painting to go with the wall. The living room below shows how a wall of solid earth red color pulls the eye toward the black, graphic furniture and the vivid backdrop. The yellow accent wall on the right soars all the way from ground to the third floor. Alternatively, bright clashing color from the same spectrum such as scarlet, raspberry, salmon and coral can look great in combination. Highly decorative wall treatments – specialized paint effects, beautifully painted wall murals, elaborate frescoes – can be most exquisite if executed in masterly fashion. The walls below are decorated in the opt-art (left) ethnic (middle) and Hawaiian (right) themes respectively. They're fine examples of how color in the same and opposing spectrum can be combined. Muted interior color suggests quiet luxury and helps provide a classic, modern background. When deciding on wall decor with paint, look to fashion, with the soft browns, taupes, mushrooms and beiges of camelhair and suede. 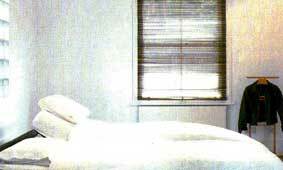 or dressed down with plenty of white to create a soothing, sensual atmosphere. The ivory-colored rooms above uses a mix of textures (feathers, leather, silk, velvet, shells, marble) to create an ethereal, romantic interior. For the contemporary decorator white is always a classic. Any shades of white with a hint of magnolia, rose or eggshell lets in the light and makes the room bright and clean. White wall decor with paint goes with anything, but what works best is more white. An all-white scheme makes spaces flow into each other or transforms a room into a private haven. Restful, clean and sharp, white is also luxurious. At the same time, it can reveal dirt and imperfections of plasterwork and clever lighting is essential to avoid the sterile, clinical look. The bedroom above has monastic white walls and ceiling. Coupled with minimal embellishment, it appears serene and allergy-free. White on white has the minimalist’s seal of approval, but it need not be stark. Using pickled wooden furniture with white walls can give a soft, intimate and spiritual effect. This decorating style has been in use since the turn of the century and has since evolved with greater focus on texture and light. The display of white corals on a bleached white display case and hanging silk and bead tassels adds texture to the all-white walls and floor (above left). For more details on this colour for your rooms, take a look at white room interior. Matt painted textures let the color speak for itself. Overtly distressed paint techniques are recent development in contemporary home decor and paint that been rubbed or washed on the wall in dilute form can provide a translucent, shimmering effect to contrast with pristine floor finishes fittings. For a slick finish, try painting wall gloss — a great solution for kitchens and bathrooms where water-resistance is a priority. Comparatively, matt and glossy walls react differently to light, and shiny ones are more noticeable than matt of the same color. Hence gloss paint will show up lumps and bumps, and is best on near-perfect plasterwork. Specialized paint effects can be laborious but well worth the effort. 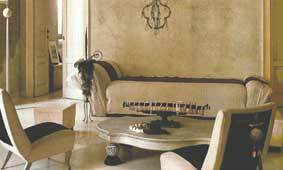 A linen finish can be obtained by first pigmenting the wall, then scratching back the plaster and effect left to dry naturally. If you like a shinier effect, glaze the wall followed by polish. Glazing walls instead of just painting is no vain glorious extravagance: they last a great deal longer. 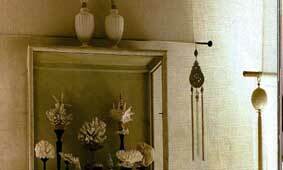 Stucco and the Moroccan version, tadelak, are very warming if polished. Some designers have a penchant for high-gloss car spray paint because of its ease of application (true lacquering takes an age). The example below shows the high-gloss result. 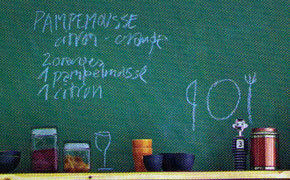 Another clever idea is to use blackboard paint and create a chalkboard wall as shown below. With time, walls will be marked by furniture or hands rubbing against the walls. Cleaning with soap will remove some of them but the wall color will change too. The best solution is to re-paint the area. When doing renovation job, always keep small cans of the paint colors used for such touch-up jobs. Or lessen the problem with paint which is formulated to make cleaning easier.